Scagliola, or “scal-yo-lah”, is a fine word, with all the flourish of a flamenco dancer. Yet the ancient technique of creating this imitation stone is very much Italian, having re-emerged from workshops in the centre of the country centuries ago. Ever since Giorgio Vasari wrote Lives of the Most Excellent Painters, Sculptors and Architects (1550), Florence has been sold as the crucible in which the Renaissance was stirred, reviving the arts of the classical world. Yet there is no doubt that scagliola makers are at home in this city of grand medieval buildings with marble façades. Just east of the city, in Pontassieve, is the workshop of master scagliolist Alessandro Bianchi. Scagliola was described by Vitruvius in the first century BC, and its revival was a later achievement of the Renaissance. The finest ancient Roman columns were of genuine rose marble, purple porphyry and green serpentine — finite supplies that had been lugged at huge effort from Egypt and Greece — and many of these columns were chopped up in the middle ages. In the 16th and 17th centuries, the best available blue stone, Afghan lapis lazuli, was more expensive than gold. 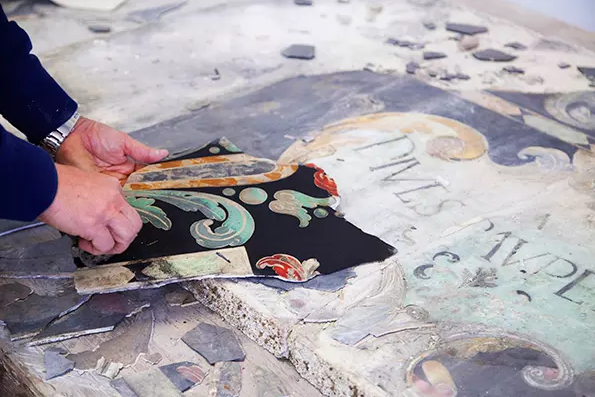 So Italians carved a market in pietra dure, the craft of cutting and cementing small pieces of colourful marble for tabletops and cabinets. In Emilia, artisans found a way of making ground marble dust into pastes that would set firmly into precisely cut holes in stone furniture and fittings. Scagliola had returned. A late 17th-century scagliola fireplace can be found in Ham House, Richmond upon Thames, south-west London. Though diverse examples were exported across Europe, its patronage and manufacture held a special relationship with Britain. The man credited with transforming the craft into an art form was Enrico Hugford, a monk of English extraction from Vallombrosa, an abbey 20 miles south-east of Florence. He experimented with crushed stones and powders of coloured oxides, mixed with clay and glue to depict landscapes and scenes, four of which were exhibited in 1737 in the Florentine church of Santissima Annunziata. His pupil, Lamberti Gori, took the technique into the city, beginning the tradition that Bianchi upholds today. Bianchi’s father, Bianco, founded his eponymous business in the early 1950s after war had racked Florence but left its prime monuments and art collections fairly intact. 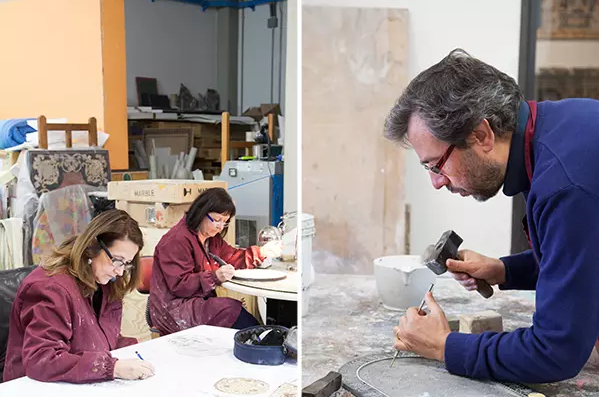 Bianchi, now the owner of Bianco Bianchi, explains how his father was “absorbed” by the display of Hugford’s work in the Museo Opificio delle Pietre Dure in Florence and the monastery in Vallombrosa. “He studied the 18th-century materials and techniques, then opened a workshop to make tables and panels inlaid in marble and scagliola,” he says. The warmth he mentions is literal. Scagliola is a compound material with much greater thermal insulation than natural marble. This makes it well suited to floors and bathrooms, but it is also an easy way to touch-test what at first sight appears to be cool stone. The raw material Bianchi uses is selenite, a gypsum that is ground to a powder and mixed with natural coloured oxides and earth from a range of yellow ochre, terra di Siena, natural yellow oxide, warm red ochre, Pompeiian red and ultramarine. 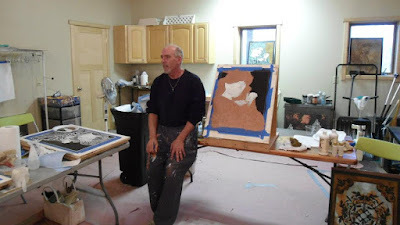 The tinted stone powder is bound with fine clays and casein (a protein derived from milk) or gum arabic from the acacia tree, following his father’s recipe. So far, Bianchi’s explanation of materials and methods respects the traditions of scagliola that found favour during the age of the Grand Tour in the century after about 1715, when the British milordi trundled across Europe in search of antiquities. Beholding the great marble columns of a lost golden age, tourists demanded reflected glories in their own hallways and dining rooms from Scotland to Cornwall. 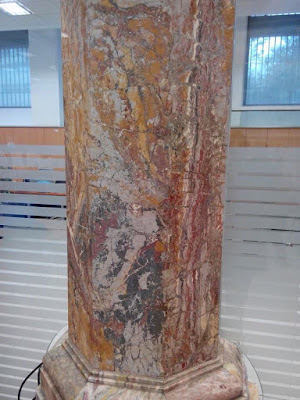 Scagliolists achieved the look of ancient Roman marble monoliths by spreading a gypsum base around columns of brick or lath-and-plaster, adding a coloured layer with chips of alabaster and further colour or veining effects by wiping a web of silk threads dipped in pigment, polished to a glossy finish. Some effects were improbable: John Nash had blue columns imitate cylinders of lapis lazuli in the Music Room of Buckingham Palace. Nor was he the first. Such commissions encouraged not just Florentine pride, but a university chair in scagliola techniques at the city’s Accademia di Belle Arti. Bianchi sees history and tradition as very important, but no less so than innovation because scagliola is still relatively unknown outside Italy, and the company’s marketplace has changed. Some of his own work can be found in a tabletop at Kensington Palace, it is true, but other pieces were commissioned by fashion houses such as Versace and Céline. The Sultan of Brunei is also a client, plus numerous architects with site-specific commissions. To evolve the craft, Bianchi has recently juxtaposed scagliola with other materials such as wood, Plexiglas and gold. Bianchi’s aim is to produce pieces that are detailed and more refined than those of his workshop’s competitors. “[A lot of scagliola] is made with synthetic resins, not natural materials, using cheap workers with a very poor artistic value,” he says. He leads by example: “We have a very important collection of antique scagliola works dated between the 17th and 19th centuries that can be visited by appointment — a unique museum in the world.” Take that as an invitation.